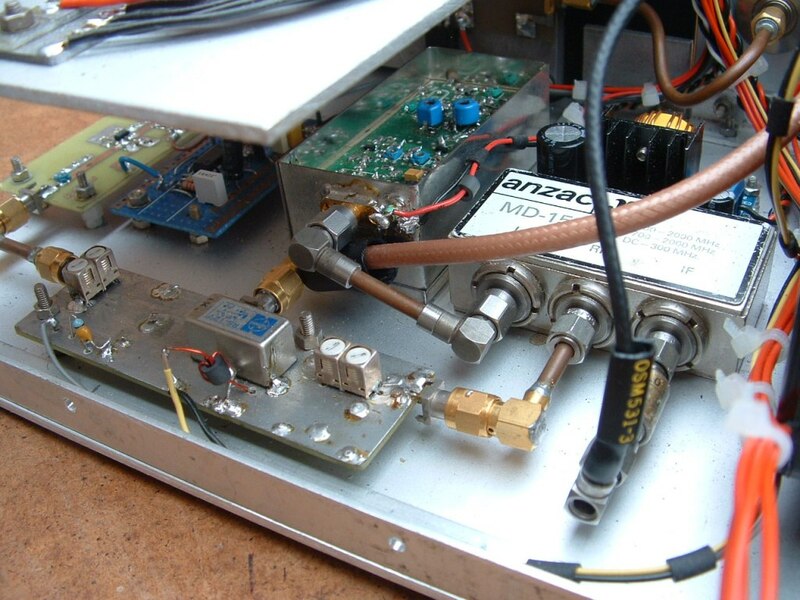 The heart of this transverter is a Practical Wireless Meon circuit board which I purchase on Ebay. The PCB had been populated but was untested and when I fired it up the transmit mixer chip did not seem to work. The board was designed to tranvert 70MHz to an IF of 144MHz but I decided to cut my losses and re-cystal it to work with a 28 MHz HF rig instead. The Meon gives two local oscillator outputs a +17 dBm for the TX mixer and +7dBm for the RX mixer. The +17 dbm output is taken off board to a high level SRA1H ring mixer which is followed by the rather large TX filter. The output of the filter drives a converted Pye Westminster PA strip, which has been modified for linear operation. The maximum saturated power output is just under 4W but 2W is a more realistic output power for linear operation. There is space in the case to add a high power PA but that is another project. The double relay board is a simple Tx/Rx sequencer but with no external Rx preamp and no high power PA it is not really required. Top view showing the relay sequencer board and 12V power distribution. The 144 MHz IF switching and 10 watt load are housed in the black diecast box.The small blue PCB with the toroid coils is an off the shelf 12V to 24 Vdc convertor for powering the mast head preamp and it's associated 24V antenna change over relay. 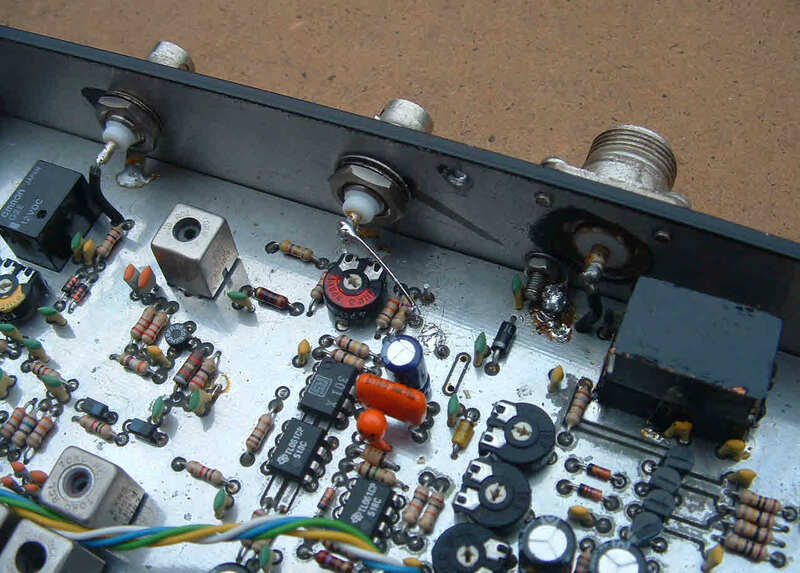 The power amplifier is a Mitsubish1 M57762 gain block amp giving 10W output. 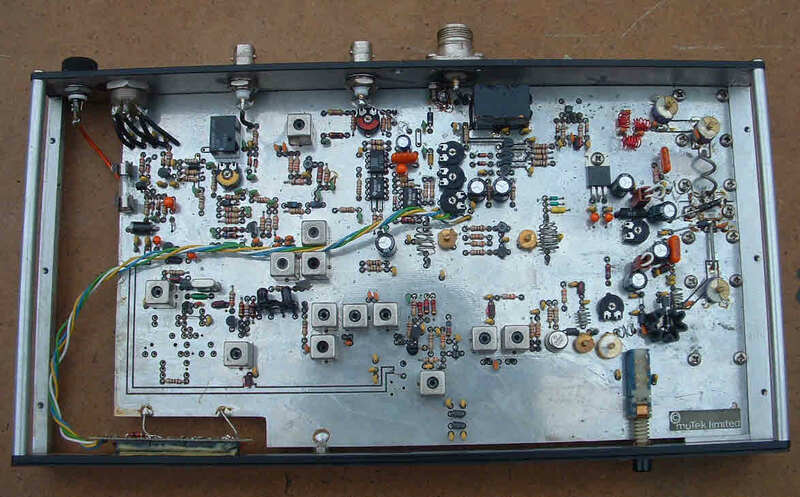 The LO is a G4DDK unit which gives about +4dbm out to drive the Anzac mixer. 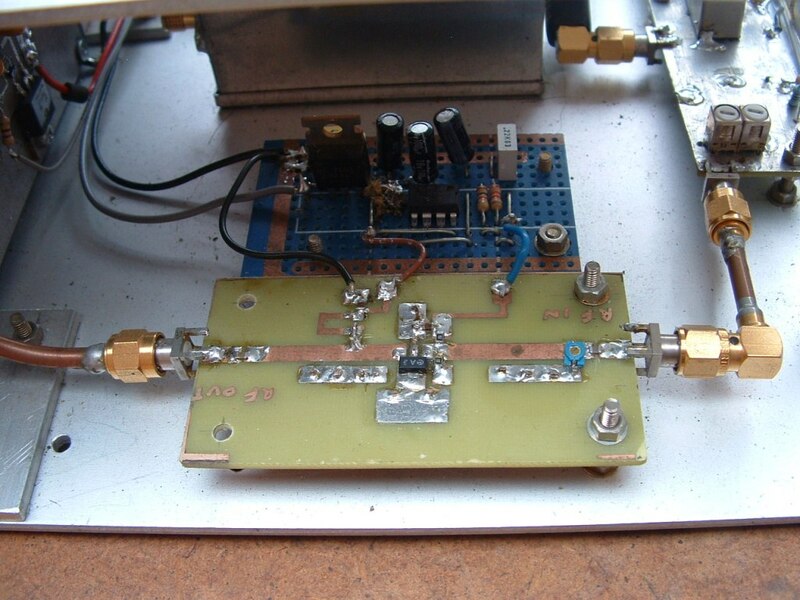 The 1296MHz signal from the mixer passes though a helical filter and a minature relay for the Tx/Rx switching. The Tx signal is amplified about 20dB by a 50 ohm MIC device and through a second helical filter. A FET device provides a further 17dB of gain at 150 mW output to the gain block PA module. 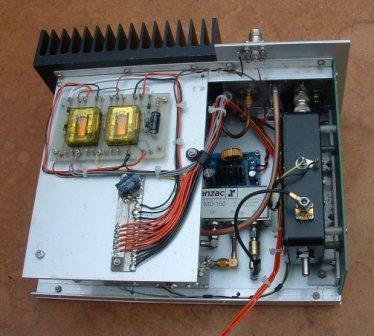 The mast head amplifier is a G4DDK unit which is really designed for EME use. 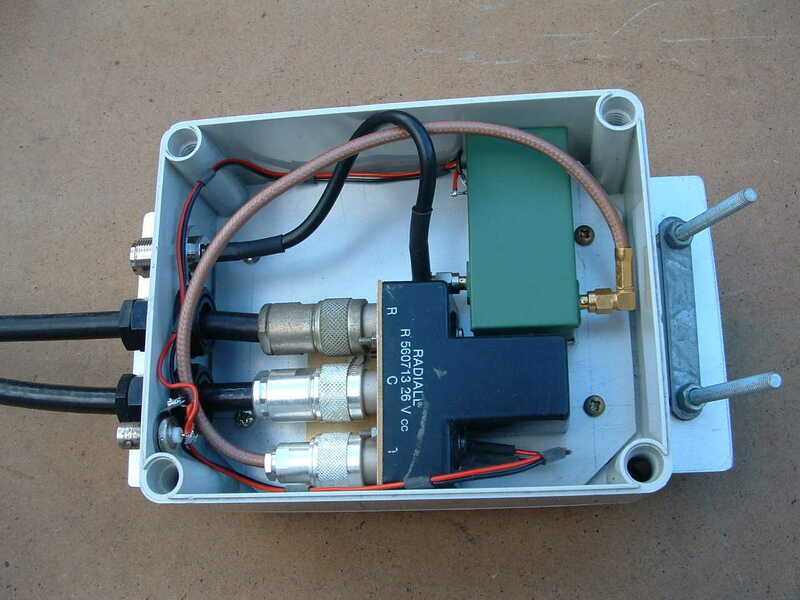 It is a two stage low noise amplifier with no interstage filtering and has an overal gain of about 34 dB. At my home location this is fine but it could be susceptable to blocking if used out portable on a hill top location. 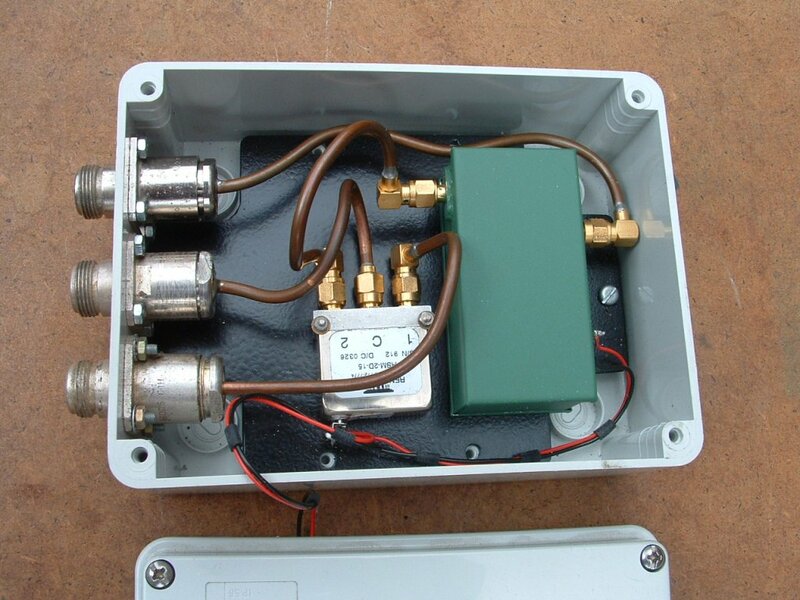 The antenna change over relay in my original 23cm Mast Head Amplifier looked a little small for my proposed 4xMRF9060 200W 23cm amp.I have built a new one using a Radiall relay. The relay is much heavier than the SMA type so to reduce weight I have made the rotator tail and antenna tail intregal to the unit which save the weight/loss of 4 additional N connectors. Power is 24Vdc on RX as before.Weight including cable tails is spot on 2kg. The G4DDK RF amp in the old unit has now been swapped for the physically identical 3.4 GHz unit. Not much change of getting more than 30W on 9cm! Another Ebay purchase. Dates from 1985 and was state of the art design. 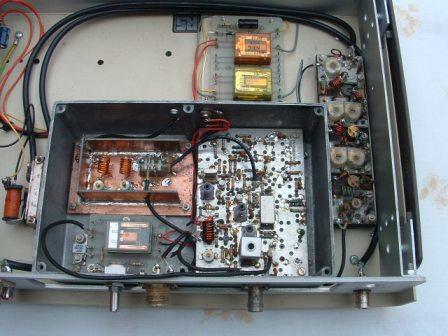 The unit has a push pull 2x BF981 FET devices in the RF front end followed by a diode ring mixer and BRF96 IF amp. 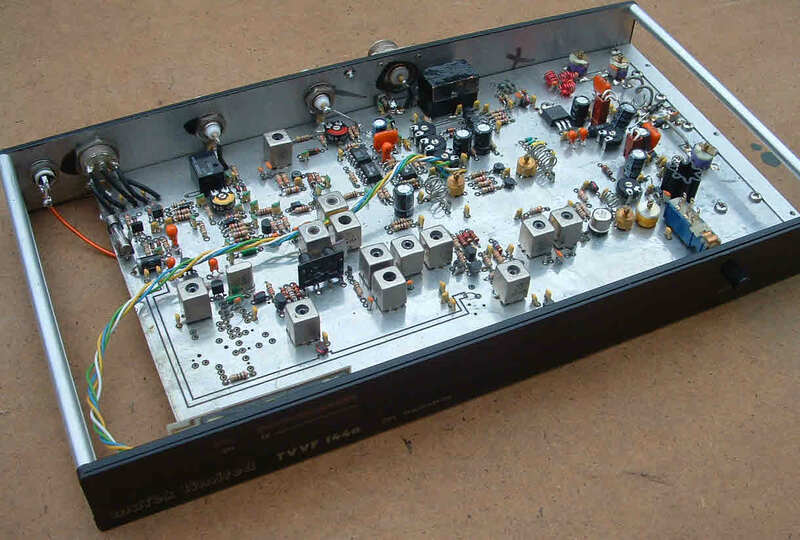 The TX give a good 10 Watts output. The unit can be configured for seperate TX & RX 28 MHz IF ports or relay switched from a single connector to the HF driver rig. RF switching can be set for RF sensed or hard wired for PTT to ground or +12V switching. Unusually the unit has its own ALC generator and associated TX power output bargraph display. The unit is designed to be powered from an external 12Vdc PSU. The user handbook is a little sparse in detail with only a basic schematic diagram, no circuit diagram is included. 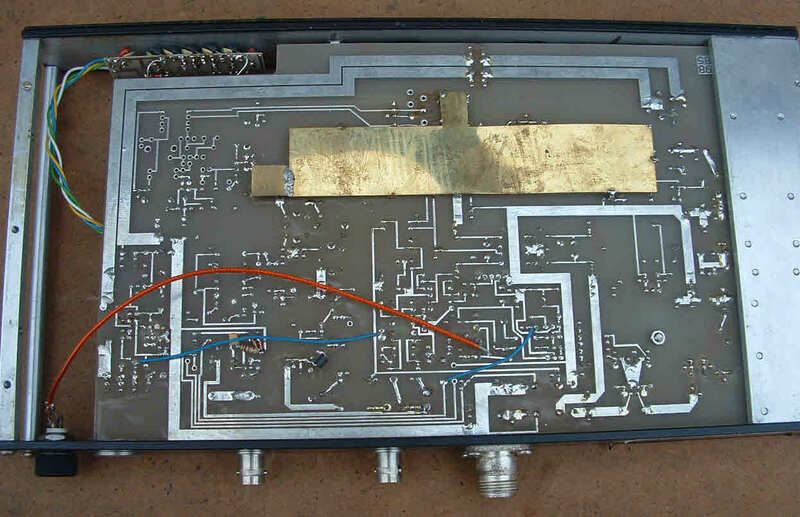 Transverter bottom view. Brown coax is previous user modification.